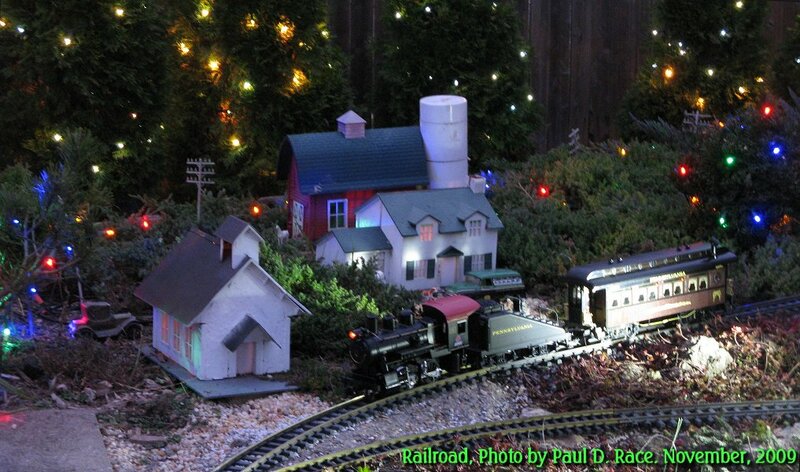 For the first ten years or so of my garden railroad's existence, I seldom ran trains after nightfall, and when I did I was usually satisfied to see locomotive and passenger car lights circling the track. However, a few years ago, I started experimenting with various kinds of lighting, and the experiments intensified when I started having after-dark "open railroads." 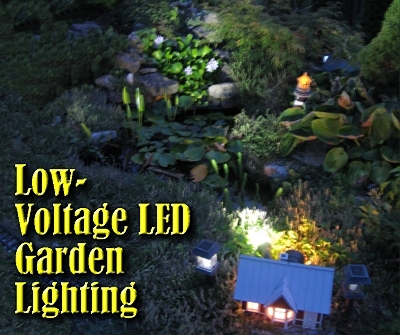 This is a record of my experiments with a new variation on various garden lighting approaches - one that combines 12-volt lighting (from low voltage sets) and LEDs (popular in solar lighting). 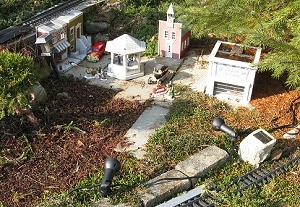 In 2007, we hosted a teenager's birthday party that went well after dark, and the pavilion we set up blocked all light from the house from getting to the railroad. I was surprised at how dark everything looked without the stray porch lighting, etc., filling in. 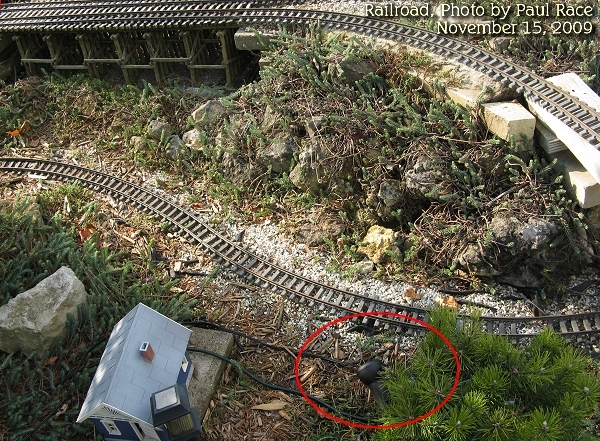 Never one to trust manufacturer claims, I started experimenting with solar lights to see if they would provide enough light to make the railroad look "operational" after dark. Some were inadequate, but some were useful, and some could be made useful. For a history of those experiences, click here. 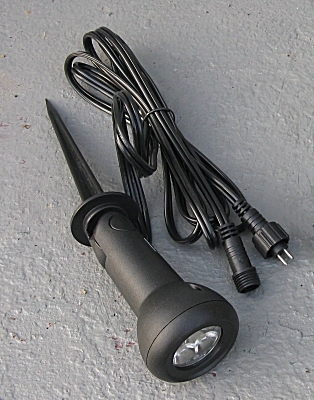 In 2008, I tried those 12-volt garden lighting sets, starting with a cheap set then supplementing it with a Malibu-brand set that was better in some (but not all) ways. I also went from sticking the light fixtures under the buildings to buying sockets and screwing them into certain of the buildings, a much "cleaner" way to do things. For a history of those experiences, click here. The "360-degree" incandescent lighting products in these lines work pretty much as advertised. However, I was disappointed in the flood lights. The stock bulbs gave the area they were supposed to be illuminating only a dull glow. And if I had used higher-wattage bulbs, I would have had to reduce the number of light fixtures per circuit. Then, in early 2009, I saw a new line of products which seemed promising. WalMart (the only big store I can get to and back on my lunch break) carried a Brinkmann line of powered LED garden lighting. One package had four "flying saucer" lights (the kind they call "tiered") and two spotlights, and one package had six spotlights. I didn't need any of the "flying saucers," having no place to put them, really. But I thought the "spot lights" seemed promising, so when WalMart marked them down in late summer, I bought a set. A week later, I had time to pull the set out of the box and experiment with it. 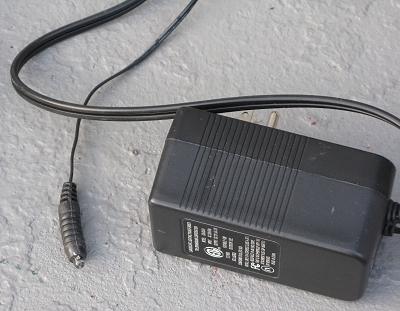 Power Supply - Although the power supply is rated similarly to my other garden lighting power supplies, it weighs much less, and, frankly, doesn't seem quite so sturdy. You can see that, except for its small size, the 12-volt, 20-watt power supply looks pretty much like any other 12-volt power supply except for the electric eye that is attached by a cord, presumably to let you fasten it up in the sunlight somewhere. 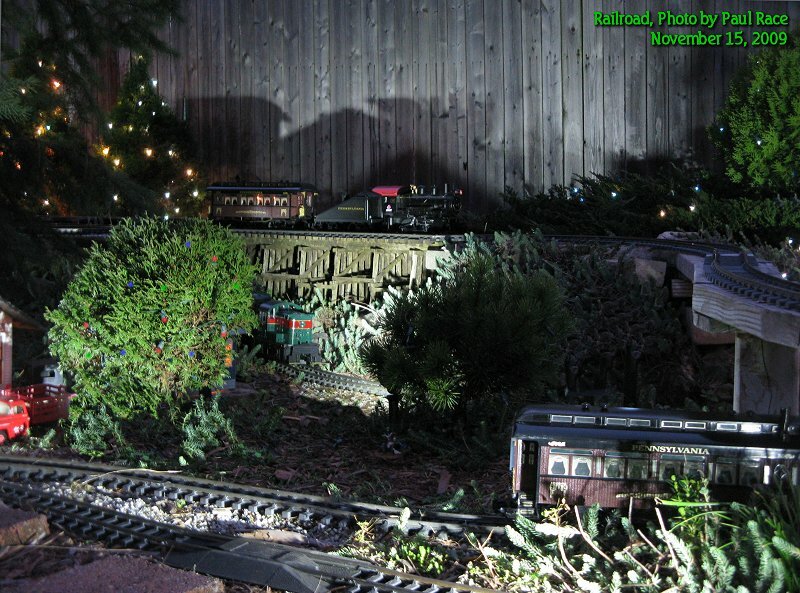 I could do that, but most of my railroad lighting "electric eyes" are actually buried in the foilage somewhere because I want the lights to come on at twilight, not after dark - it gives a very nice effect. I put the Brinkmann's electric eye under a hosta clump so the spotlights would come on when the rest of the railroad lighting does. Now that I've had the lights hooked up for a few days, though, I'm considering putting the electric eye someplace more exposed; the spotlights don't really need to come on at the same time as the other lighting. 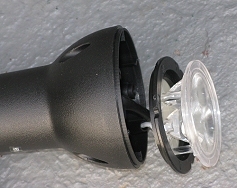 Spot Lights - The spot light fixtures are compact, and more solid than the "flood lamp" fixtures that came with my "ordinary" incandescent 12-volt garden lighting sets. A peek inside shows that each fixture holds three LEDs wired to a tiny circuit board and stuck into a clever lens-diffuser molding with a sort of fresnel-lens pattern on the face. Most LED's I've experimented with topped out about 7 volts, so I wondered if they were wiring the fixtures in a series and or putting a resistor of some sort in the line to get these to behave on a 12 volt circuit. I can't tell for certain without pulling the fixture apart, but it sure looks like there are two tiny resistors on the circuit board. Presumably, the electronics of each fixture "step down" the voltage going to each LED to keep from blowing them out. So if each fixture actually handles 12 volts, that gives me some ideas that I'll need to test with a "spare" fixture. Externally the fixture are obviously meant to be strung along a single linear circuit. 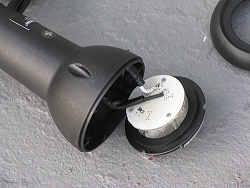 Two five-foot long wires come out of the fixture. One has a "male" two-conductor plug on the end, and the other has a "female" plug on the end. In theory, since there are six spot lights in the box, you should be able to stretch them out across a 50-foot area (only the 10'-lengths of wire between the spotlights count in this math. The Wiring - Each plug on the wiring has a notch that keeps you from sticking the wires together wrong. Current can only flow through most LEDs in one direction. I'm guessing that the manufacturers are worried about folks putting half of the fixtures into the circuit backwards, then taking the whole set back to the store because "only half of it works." I'm not quite stupid enough to make that mistake, but I was surprised by how strong the warnings are against splicing or shortening the wires. Here's an example from the two-page "manual": "Only use cables provided with product. Do not splice cables. Coil excess cable between lights around stakes and bury." I got six spotlights in my "starter set," and that turned out to be at least six fewer than I will need for a permanent installation of this product. In my first experiments, I behaved myself and did not figure out what would really happen if I sliced and diced the wiring setup for my purposes. If I accidentally wired one backwards and it really did cause a burnout, or global warming or some such, I'd have been be down to five fixtures, even fewer than I "needed." Brinkmann's attempts to make this set "idiot-proof," then letting people like me buy it reminds me of the old engineering axiom, "If you design a product to be 'idiot-proof,' the first person to come along will be a more ingenious idiot." At first, I liked the physical form factor of the spot light fixtures. 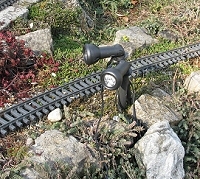 Unlike most solar lights, the fixtures are small enough either to be hidden or at least not to take over the landscape. 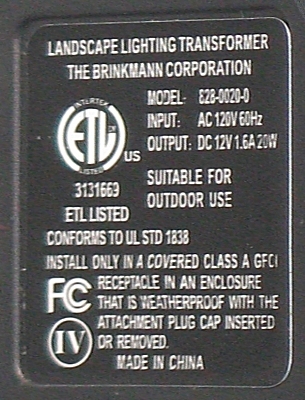 The photo to the right shows a Brinkmann LED spotlight next to a lit incandescent floodlight from a "traditional" 12-volt set. It was just as well that I didn't slice or dice any wires at first, since I wound up moving things around a bit after it got dark and I could see just how bright and focused the little spots were. The Ten-Foot Rule - The mandatory 10-foot length of wire between the floodlights is a problem. The manual shows you laying them out in a nice evenly-spaced row. I suppose that the assumption is that you'll only buy this set if you plan on lighting something no more than fifty feet long, or else lighting six things that are uniformly ten feet or less apart. But the items on my railroad aren't uniformly ten feet apart. They're clustered, with open spaces in between the clusters. The result of trying to use this set on my railroad without cutting and splicing wires is that I had huge "wads" of wire where I wanted two spots close together, and I would have to "waste" fixtures in places where I would ordinarily not bother to have lighting. It's analagous to lighting a set of those little cardboard Christmas houses with a strand of C7 lamps - you can only move the houses so far apart unless you want to leave a bulb exposed. If you're thinking that the photo to the right shows nothing in particular, you're right. 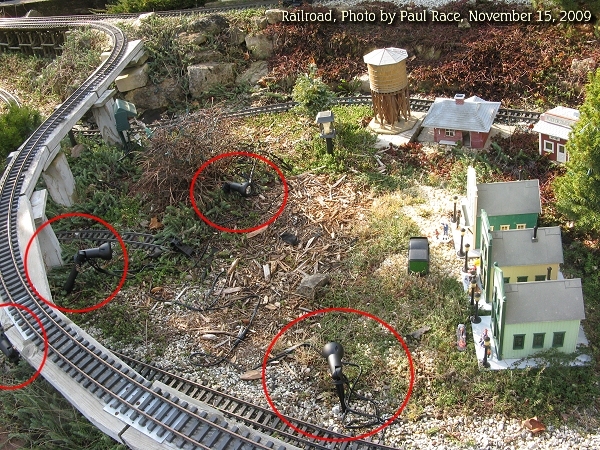 It shows a nondescript bit of my railroad where I had to put a spotlight just because that's the way the kit works. Eight feett to the right is a town lit by only one spotlight, where I could use two, but I had to "waste" a light illuminating "wilderness." Again, once I get out the splicing tools, soldering irons, and shrink wrap, these shouldn't be problems, but they are considerations for someone who is worried about things like warranties. Maybe next year's version (if they don't drop this line altogether) will have a method for attaching the lamps wherever you want (like you can on incandescent sets) with color-coding or some such to help newbies keep the polarity straight. By then it was twilight, so I tried to get photos right away, and then later when it was a bit darker. The first thing I noticed once it got dark at all was how bright these lights are compared either to the solar rock floodlights (no great surprise) and also than the low-voltage incandescent floodlights. The beams are also much more focused (because they're supposed to be spots, not floods), so they are very good for lighting something from several feet away. In some cases this gives me more options for hiding them. For example, I can light the waterfall across the pond with a fixture somewhat hidden behind a building. 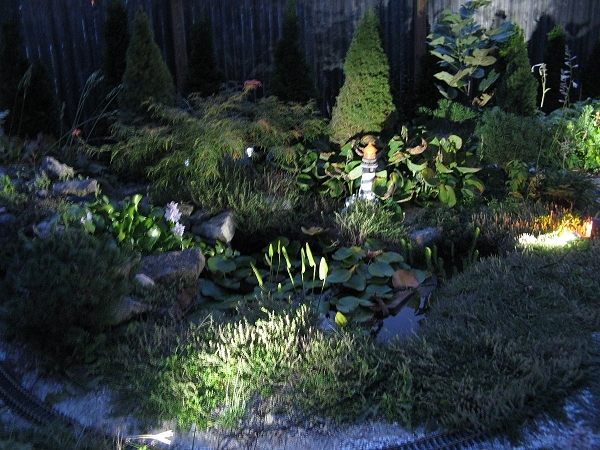 In the photo above right, you can see my pond area lit by two of the Binkmann spotlights (with a little help from a 4-watt incandescent floodlight). To make it a bit easier to tell what you're looking at, I've included a diagram to the lower right. 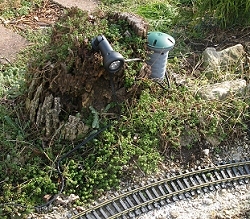 The light coming from the lower left is from the Binkmann spotlight shown in the photo with the stump. The area it is illuminating across the pond (with the lighthouse and drying hostas) is used for a city scene during my winter open house (by then the hostas will have frozen off to the ground). This is about the right level of lighting for this area, as the 8' distance gives the spotlight beam a chance to spread out a little. 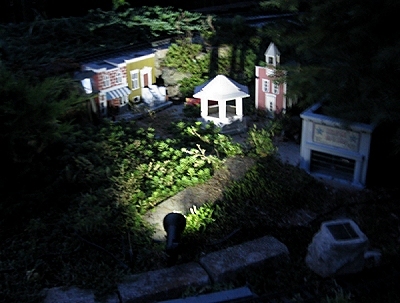 The bright light coming from the right is from the Binkmann spotlight shown earlier near the station, next to the 4-watt incandescent floodlight. It is illuminating the waterfall area, which is hard to see from this angle because of the water hyacinth and other vegetation. Again, this is about a 10' span, so the water features are visible without being overly bright. In this photo, you can also see a warmer glow near the Binkmann spotlight to the right. 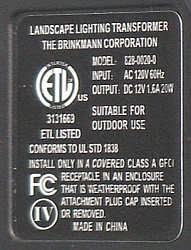 This is from the incandescent 12-volt floodlight. Before I set up the spotlights, this gave a dull glow to are where the hostas are now (and where a town will hopefully appear later this fall). But you can see that, compared to the Binkmann spotlight, which is about four foot further away, it hardly has an effect. Unfortunately, where I have a "shallower" space to work, the bright, narrow focus of the Binkmann spotlight brilliantly illuminates the middle of whatever area I want to light, and leaves things on either side in relative darkness. In the photo to the right, the only reason you can see the "garage" at all is that it is getting a bit of light from the rock-shaped solar floodlight in the lower right corner of the photo. The clear white light of the LEDs didn't bother me, as I've already experimented with (much dimmer) white LED solar floodlights. To me the pale white light on the outside of the buildings contrasts nicely with the warm incandescent glow from the windows, looking like the bright moonlight of a Hildebrandt brothers painting. The only additional issue I had, as I dodged my last mosquito and went indoors was that these things sit so low that even my creeping thyme was blocking the light from hitting some settings properly. Worse yet, the foilage in front of the spotlights was lit much more brightly than the area I was trying to light - something that wasn't so obvious when I was fiddling with the things. 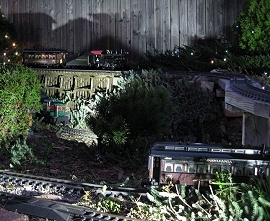 In fact, from a few yards away, the area illuminated looked rather like I had tried to light my railroad by laying six very bright flashlights on the ground ten feet apart. So I will have to figure out a way to set the fixtures a little higher. Also, the light fixtures don't bend more than 90 degrees, so it you want them to shine "down" at all (or even "straight across"), you need to stick the stake parts in at an angle. Soon after I wrote the section above, I picked up another set and a few "loose" spots. 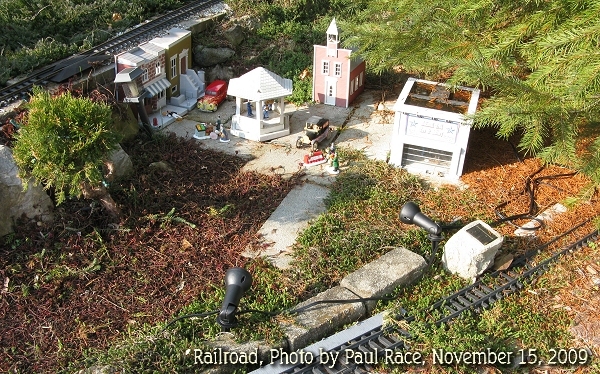 Then, in October, 2009, a friend from the Dayton-area NMRA club asked if I would be willing to have an "open railroad" again, in conjunction with the Dayton-Ohio area NMRA show in early November. I agreed, and got busy. 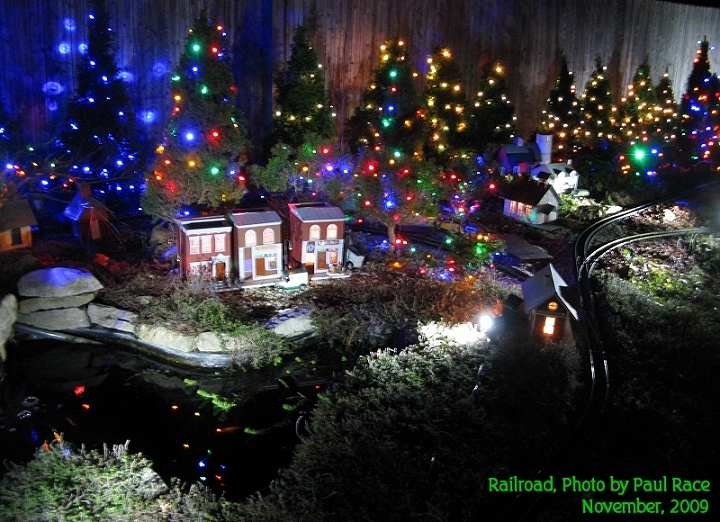 In addition to making certain that the trains were running, I wanted to improve the lighting from our 2008 open railroad. 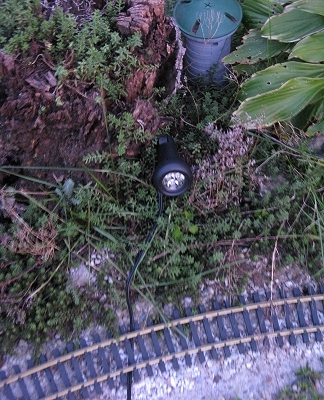 Spotlights installed near the ground still suffered from the "flashlight laying in the grass" syndrome. Finally I gave up on the idea of concealing all of the spotlights at least for this exercise. After all, I was going to be stringing lights in the conifers as well, so realism wasn't the ultimate goal at the moment. To get rid of the "flashlight in the grass" syndrome in a couple places, I "borrowed" some posts and "ground stakes" from a set of solar lamps that don't do me much good in the winter anyway, then I installed several of the spots on the posts. 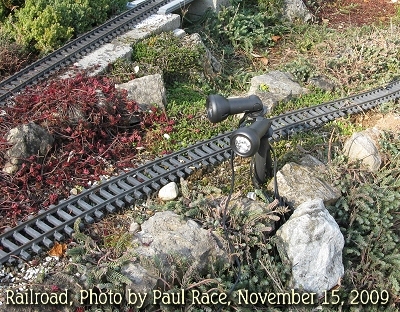 I also installed several spots that shown almost "sideways" on the railroad so they would light fixtures near the "front" edge of the railroad from the side. Silly as they may look in the photographs, these lights weren't all that obnoxious, especially after dark. What was most obnoxious was the cables, which I tried to camouflage by settling it into the groundcover, since this wasn't a permanent installation. I was going to dump mulch for extra camouflage, but ran out of time. Now I realize I don't have a very good night-time photo of the New Boston station showing the effect of the side lighting. But I did get a good photo of the farm scene - it's photo to the right. As you've seen above, I had experimented with putting a lamp behind an old walnut stump to illuminate New Boston from across the pond. But the "Stubby Fingers" sedum near the stump and the Creeping Thyme at the edge of the pond got far too much light that way. In preparation for the NMRA open house, I experimented with putting the spot on a borrowed post, but finally wound up sticking it right into the rotten wood at the top of the stump. This allowed me to get the downward angle I wanted, reducing both the "flashlight in the grass" effect and the amount of stray light hitting the privacy fence unnecessarily. 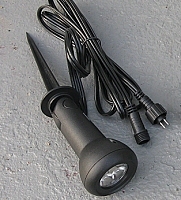 One is the LED spotlight on the stump, shown in the photo above right. One is the conventional 12-volt incandescent floodlight set behind the New Boston station. Though the incandescent floodlight is much closer than the LED spotlight, it's beam is much softer, so it fills in the shadows cast by the spotlight. Also, above, you've seen my attempt to light the village of Donnels Creek with one spot. For the NMRA open house, I chose to use two spots. They are pretty bright and fairly close, but with two spots, at least there aren't so many glaring shadows. Again, I was going to dump mulch over the cords to camouflage them, but I ran out of time. If I use these in a permanent setup, I'll hide the wiring better. Looks like I need to get an "after" photo of this, but it did look pretty nice after dark during the open house. The photo to the left below shows one of the few spots I was able to conceal from an "ordinary" viewing position. 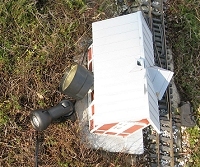 It is aimed a little trestle, which gets harder to see every year in daylight because of the fir tree that divides the railroad. At night, after dark, it used to be completely invisible. The photo to the right shows the effect of that hidden spotlight after dark now. My most extreme use of the spotlights was in illuminating the features around the north loop. In the photo to the right, you can see two spots targeting the old Western-style village of Fort Tecumseh. The spot at the lower center of the photo is aiming upward at Rocky River station (just out of the frame behind the elevated track.) The spot in the lower left corner is shooting sideways toward the Donnels Creek station. Once again, I had planned to dump mulch over the cables, but I ran out of time before the open house. 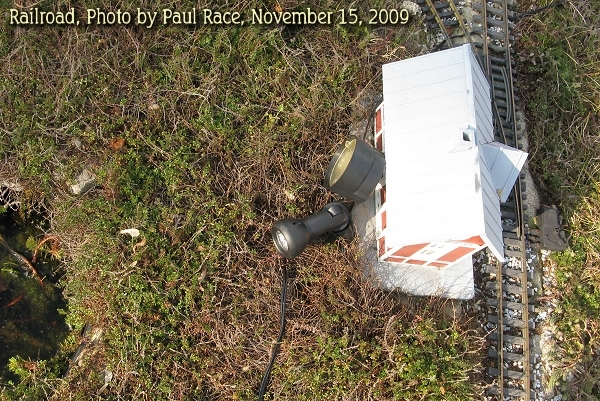 On the bright side, I think it might be possible to fasten most or all of the spotlights in this photo to the underside of the raised roadbed, which would reduce both their visibility and the "flashlight in the grass" syndrome. The next photo is from about fifteen feet farther back than the daylight photo above. 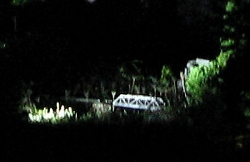 The little Rocky River station in the upper right corner is lit by the floodlight in the center of in the photo above. 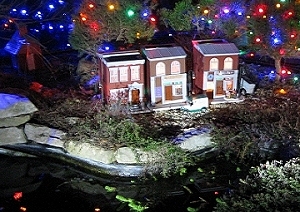 Below is a photo of Fort Tecumseh village at night, as it appears lit by the two criss-crossing floods. 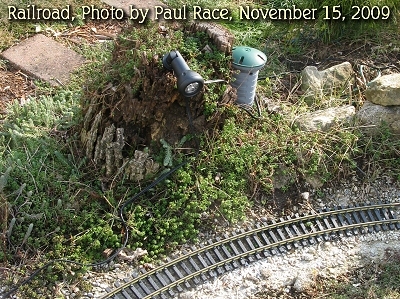 After having set up twelve of the spotlight fixtures for a seasonal (temporary) display, I am now convinced that they can be made to work for many garden railway applications (as well as their purported general landscaping uses.). The lighting was a little bright on some villages, but not so glaring your eyes couldn't adjust. And, best of all, these spots allowed me to focus attention on features that were just plain invisible the last time I had an after-dark open house. In the context of a Christmas-themed display, they added quite a bit to the "magic" and, frankly, the professional appearance, of the whole event. This technology is still a bit expensive for what you get (unless you get it at the end of the season). But it is a big step up from the average low-voltage lighting technology. If Brinkmann continues to carry and expand the line, there may be many more options next year. I now have many ideas for installing at least some of these spots in better-hidden, more permanent positions. So I'll be sure to update this article with anything important I discover during that effort. Also, if you try out something similar and have any feedback at all, please get in touch and let us know what works and what doesn't work for you.